This week, the Augur team welcomes Robert Davidson as its newest hire! Robert is a test engineer who will be focused primarily on maintaining Augur’s suite of automated tests. — Fixing light client connectivity bugs. — Finalizing mocks for the redesigned trading page & beginning to implement these changes in the UI. — Continuing to improve the calculation for net position & unrealized profit/loss. In addition to this, the team now has an initial plan for syncing Augur Node more quickly using regular database snapshots. Work on this will begin after the holiday break. Check out the newest addition to the Augur ecosystem. 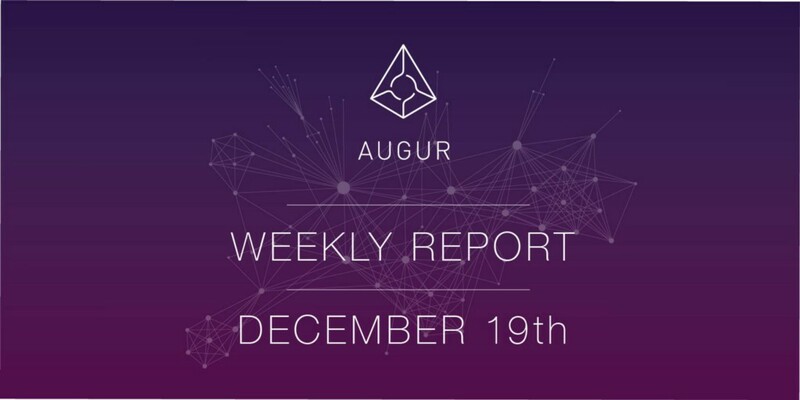 Crystal Ball Be provides some unique data visualizations of Augur market data as well as Japanese translations of the whitepaper and several prominent blog posts. Follow them on Twitter. Reminder, the Forecast Foundation has no role in the operation of markets, trades or actions created or performed on the Augur protocol, nor does it have the ability to censor, restrict, control, modify, change, revoke, terminate or make any changes to markets created on the Augur protocol. The Forecast Foundation has no more control over the Augur protocol than anyone else using Ethereum.